Several downtown Chelsea businesses and the Chamber of Commerce are preparing for a major retail promotion this coming Friday, Saturday and Monday that looks to capitalize on back-to-school shopping. Chamber Director Rich Cuthie said there are some 20 businesses participating in the promotion this year, and it looks to be bigger and better than ever before. While back-to-school is the major retail push in the promotion, one doesn’t have to be after pencils and sweatpants to take advantage of the effort. Stores include clothing stores, phone stores, bakeries, pizza shops, nail shops and even a barber shop in the Parkway Plaza. Aside from the sales, the Chamber will be holding a drawing for three Mastercard gift cards – $100, $50 and $25. To enter the drawing, one needs to make a purchase at a participating store this weekend, and take the receipt to the Chamber of Commerce office at 308 Broadway. Cuthie said the push is very simple – to capture the foot traffic on Broadway and get them to think about buying locally. City Manager Jay Ash says the construction of the Wyndham Chelsea Hotel on Everett Avenue helped start a new era in the city, transforming a blighted industrial area to a place of great pride for the community. Ash said more than 200 people attended the hotel’s groundbreaking in 2000 despite a driving rainstorm. And the new leader of the Wyndham staff in Chelsea is David D’Arcy, who assumed the position of general manager on November 11. 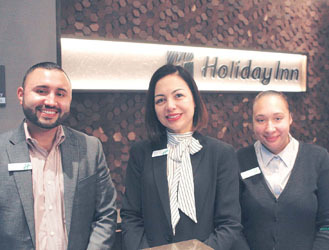 D’Arcy was welcomed aboard by Steven Haley, director of sales since the hotel’s opening in January, 2001 and who has become a familiar face in the community. D’Arcy will oversee all the operations of the 117-room hotel including the sales and marketing, food and beverage, staff development, transportation to Logan Airport, and customer satisfaction. He will be working closely with Haley in the management of the hotel. He grew up in West Roxbury and graduated in 1985 from Catholic Memorial High School where he played soccer. He studied business management at Suffolk University and Northeastern University. D’Arcy was the general manager at the Radisson Hotel in Plymouth (Mass.) for the past four-and-half years. D’Arcy said he has always respected the Wyndham Hotel name. “I think the Wyndham is a great name and I hope to bring a lot to this hotel,” said D’Arcy. Any changes in store at the Wyndham? “Down the road we look to renovate some of our first floor rooms as well as the fitness center,” said D’Arcy. The new GM has toured the city and is optimistic about Chelsea’s continuing growth and development. D’Arcy hopes to join local organizations, some of whom hold their meetings at the Wyndham. “Being part of the community is vital to the hotel,” said D’Arcy. D’Arcy and his wife, Lynne, have a daughter, Alexis, 6.